The Leckey Squiggles Pediatric Stander Package provides comfortable alignment as an upright child stander. The package comes complete with all the custom features added to the Squiggles Standard Model and is shipped fully assembled. The Squiggles Stander is designed to provide pelvic stability and ensures that the head, body and legs are aligned to allow the child to stand comfortably. This standing position will allow kids to be more involved with their surroundings and participate in more effective standing therapy. The Squiggles Pediatric Stander by Leckey can be used as a prone stander, a supine stander or an upright stander. 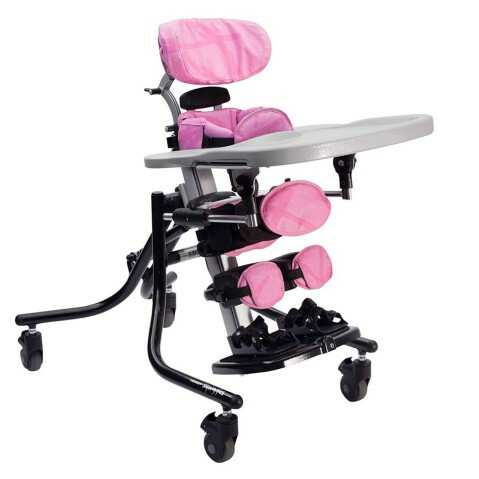 It comes with adjustable padding that provides plenty of comfort and support for the joints as the child stands. The design is meant to be functional and durable. Its adjustable features allow the chair to grow with the child. When not in use, the stander can be folded up into a more compact position for easy transport and storage.